The Universe is filled with a rich diversity of high-energy phenomena and highly energetic processes. Great developments in astrophysical observations over the last years, as well as in-tandem simulation studies, opened a wide window into the understanding of the electromagnetic wavebands of astrophysical phenomena, from the radio waves up to the high-energy gamma-rays but also to high energy cosmic-rays, which carry a multitude of information about the most energetic phenomena in Cosmos. Accelerated particles (cosmic-rays) are believed to be created in the cataclysmic ”explosions” of astrophysical sources like Gamma-Ray-Bursts and in the jets of Active Galactic Nuclei. 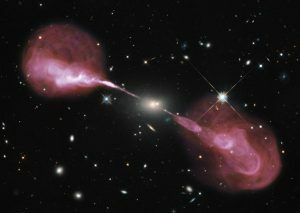 The acceleration of cosmic-rays and the emission of very high energy electromagnetic radiation (i.e., x-rays, gamma-rays) mostly occur in the relativistic superalfvenic cosmic plasmas and jets that act as cosmic accelerators. In this talk I will give an overview of these high-energy accelerators and will discuss the mechanisms responsible to producing very high-energy cosmic rays and radiation.